There is a section of Ivy that is more tree-like than vine. 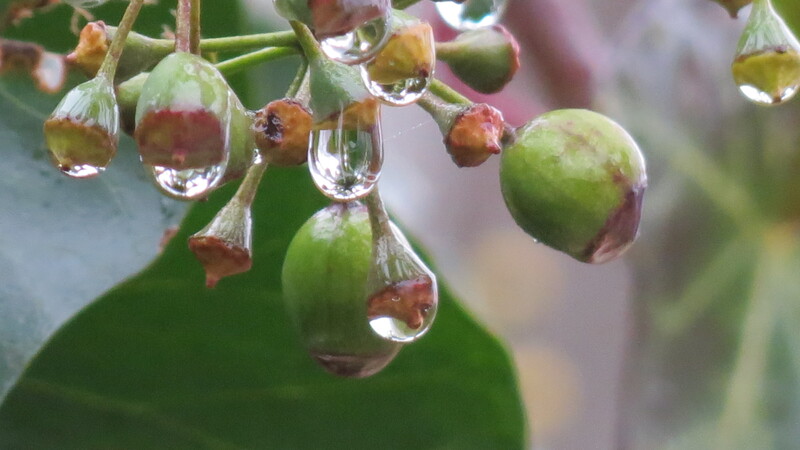 It’s the only spot with flowers and fruit, now dripping with water. 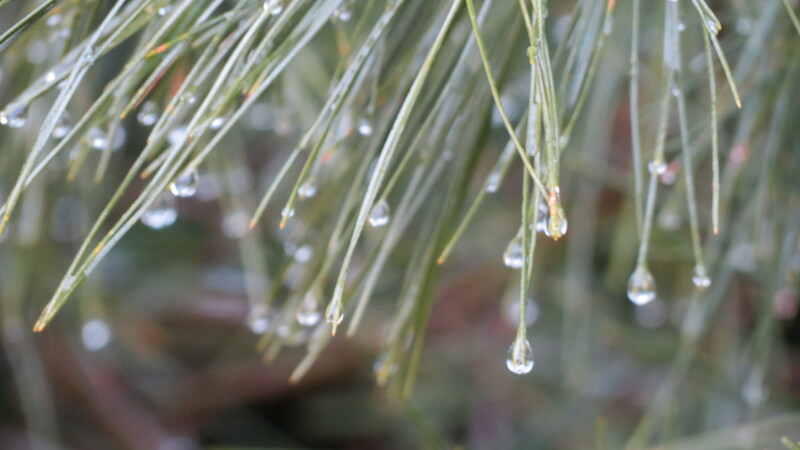 The feathery needles of the White Pines look as if they are bedazzled. 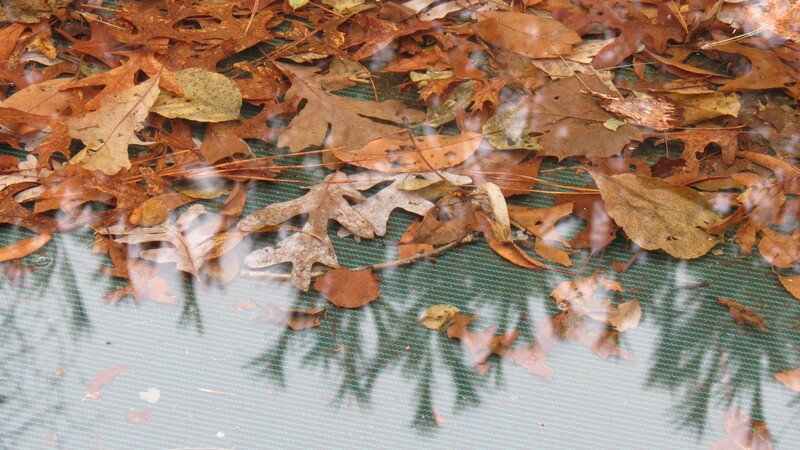 A few days ago, these leaves on the pool cover were encased in ice. 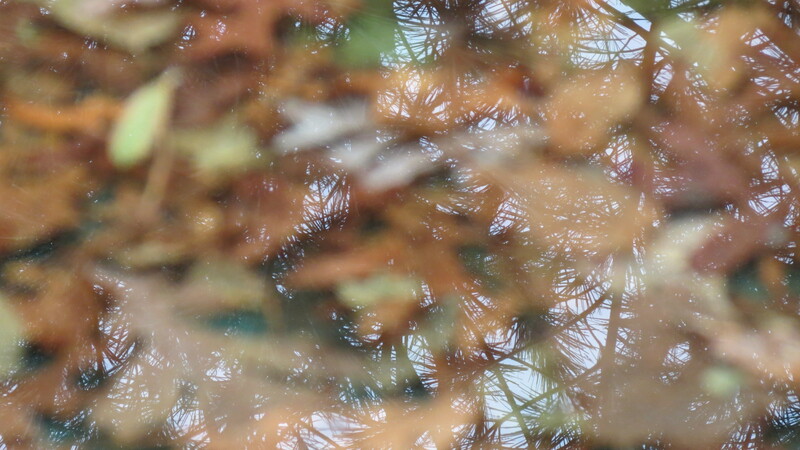 Now the camera can’t decide if it wants to focus on the leaves or the reflection of the trees that once held them. Crystal beads or. . . The fresh, pale colors of a new Ivy. Margaret Roach Week Is Coming! Nitty Gritty Dirt Man will be one of the “stops” on the tour, and in honor of the event, January 20 will begin a series of posts about Margaret, including an exclusive Q&A and a book giveaway. I hope you’ll be able to join Margaret and me for an exciting week. beautiful pictures !! over here we are going to have real Winter with freezing temperatures even during the day and snow is predicted !!! for at least 2 weeks ! I am not amused ! I’m not even amused reading that comment. 🙂 Stay warm, Gwennie, stay warm. 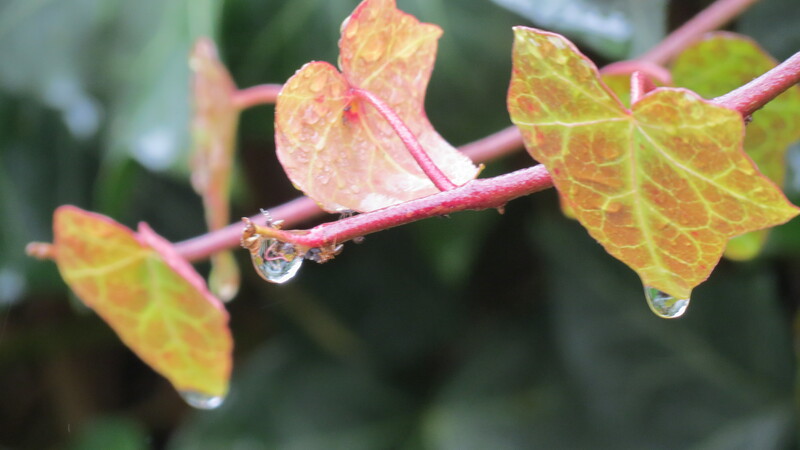 Your photographs are beautiful and a unique reminder that every drop of water really matters! Many thanks. I appreciate your visit and comment. Be well! Nice pictures. That is definitely good use of a gray day. Here’s hoping the rest of your day was cozy. A blog tour sounds intriguing. How does it work? 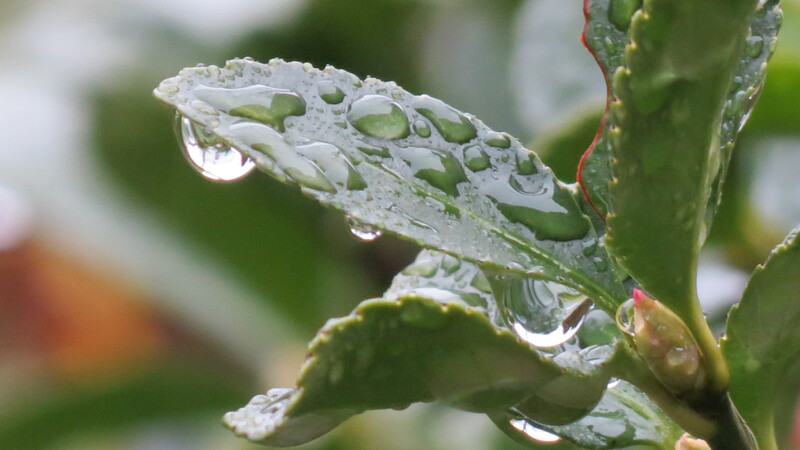 The drops of water are mesmerizing. They are a universe unto themselves. The picture of the euonymous looks like a big mouth to me. 🙂 I love the idea of a blog tour. I’ll be sure to stop by. I posted my answers/questions today! I hope you like them. A blog tour is definitely a cool idea — looking forward to Margaret Roach Week. 🙂 I’m on my way over to your site. I also have that fever. 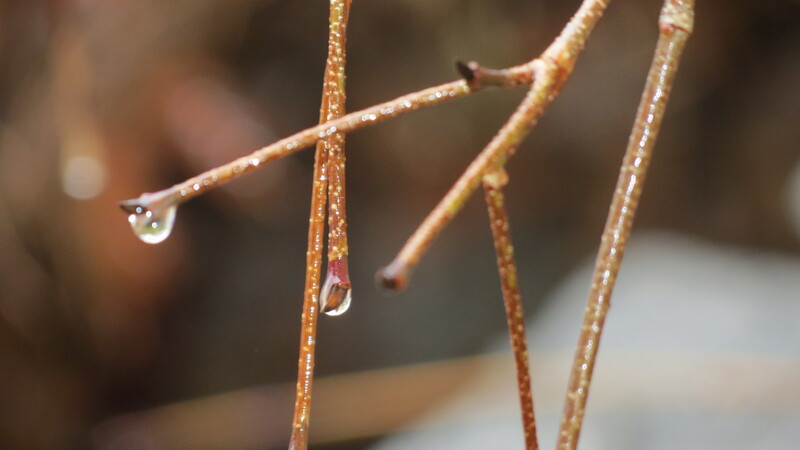 Although the temps have been mild, it’s also been damp — but spring fever has set in, nevertheless. Too as there’s still more of January, February, and most of March. 🙂 Be well! It was 62 F here in Ohio! I took advantage of it and did exciting things like washing cars and cleaning chicken coops. I’m ready for spring. I’m itching to get the veggie garden going again. 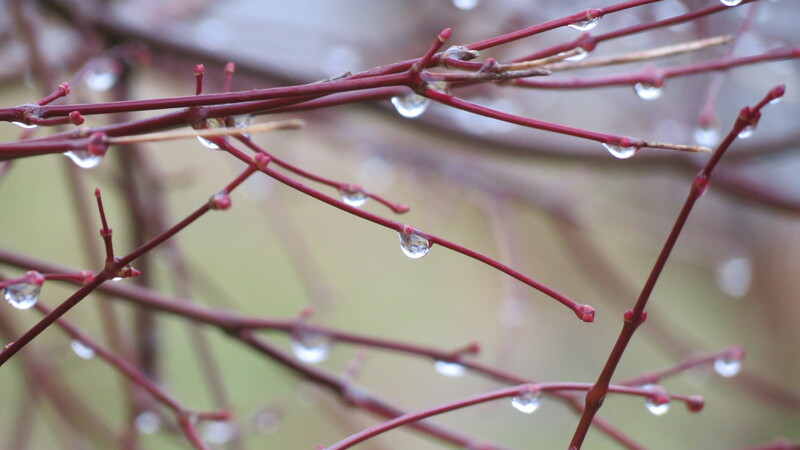 Finally had the luxury of doing some blog crawling and had the wonderful surprise of your rainy day pictures. Such a nice change from the normal winter drab. Hi Debra. I know you will become a Margaret fan. Enjoy your magical time of year – it’s got to be better than any heat wave. Flavia, I’ve seen on the news about the heat, brush fires, and dust storms in your part of the world. I’ve also seen the new colors added to the weather temperature maps as a result of the heat. Stay cool, and I do hope some moisture comes your way. Be well. I especially love that first photo! We have had rain through this entire month so far. Your photos are an inspiration to see the beauty out there, though I will need a good rain jacket to do it. Hi Deb. Glad you enjoyed the photo. 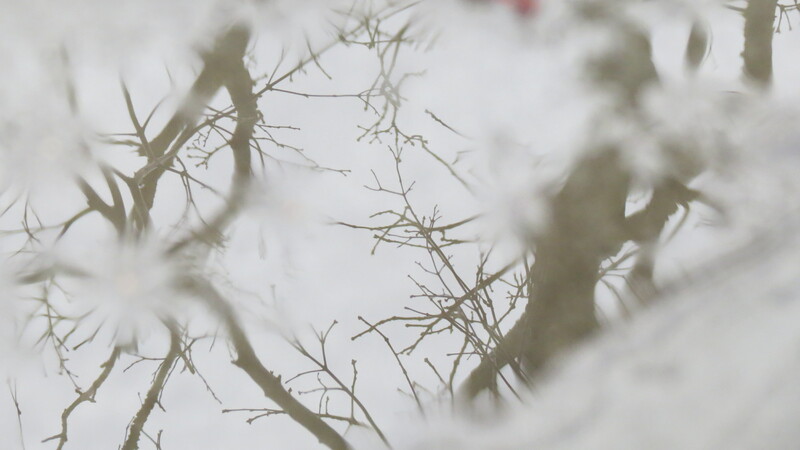 All I did was look down and notice the reflection of the branches in a glassy puddle. Hope things dry out for you soon. Hang in there. Is there a way to contact you off-line? I’d like to get your input, design ideas on my house. Not sure if I ever told you but I got divorced exactly one year ago this month and last year, I purchased an old home from an Italian woman who lived in the house for 75 years (she actually passed away in the house). Not long after I closed, my ex, (who is a contractor) and I spent the entire month of April, 2012 ripping out all the overgrown “stuff” around the house. We ripped, we cut, we chainsawed you name it. Now the landscaping around the house is bare and I just don’t know what to plant. I definitely want some dwarf plants (nothing that will grow too big) because the house is small (built in 1915) but I want something different, interesting…something that looks good during winter but even better during spring & summer. Would you be interested in giving me your input? Ppppppppppplease??????????? I’m very flattered. Now’s the time to start getting ideas and to have an understanding of sun and shade. You can make note of what’s planted in your neighbors’ yards — but also at many local businesses and shopping centers and even some gas stations. Very often, they work with landscape architects (thereby doing the work for you) and then contract with local landscaping companies. You might also want to visit a local arboretum — and you might also find a list of native plants on line. That’s at least a starting point. One of the best things about “discovering” Margaret Roach is finding more and more wonderful garden blogs via her website. 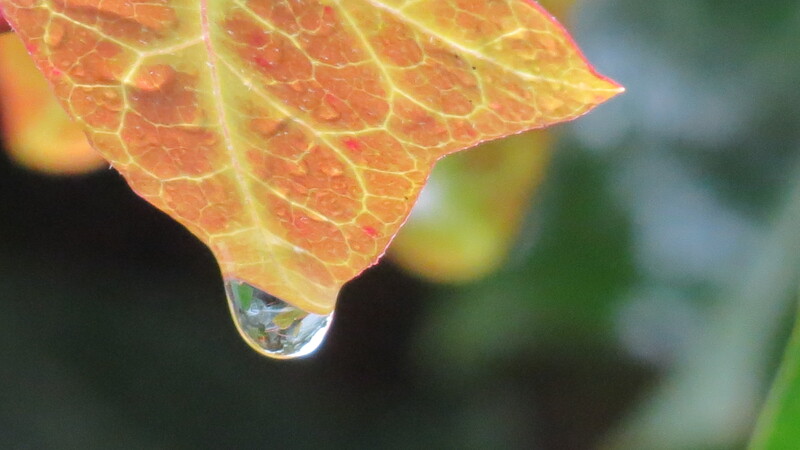 Your pictures are amazing, the kinds of things I try to do with my little point and shoot but seldom achieve. Cindy, welcome and thanks for stopping by. I appreciate your kind words. To say that I am deeply honored to be part of Margaret’s blog tour and that I was mentioned on her site — well, it would be an understatement. 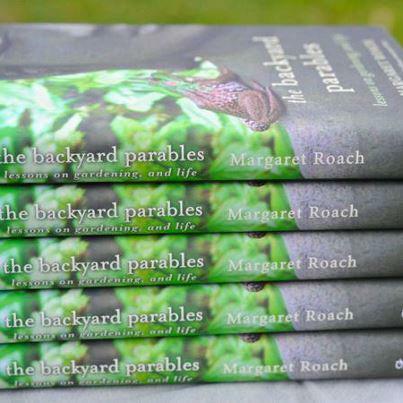 She is an amazing gardener, writer, photographer, and teacher. Be well.